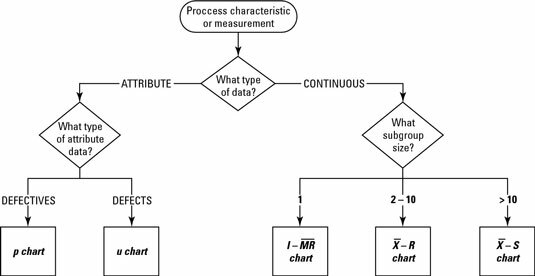 The primary SPC tool for Six Sigma is the control chart — a graphical tracking of a process input or an output over time. In the control chart, these tracked measurements are visually compared to decision limits calculated from probabilities of the actual process performance. The visual comparison between the decision limits and the performance data allows you to detect any extraordinary variation in the process. The control chart you choose is always based first on the type of data you have and then on your control objective. The control chart decision tree aids you in your decision. Define what needs to be controlled or monitored. Determine the measurement system that will supply the data. Make appropriate decisions based on control chart information.